I admit, I was very skeptical about feta and watermelon together, but after my first attempt at this Watermelon Feta Salad Recipe, my fears were diminished. The cold, fresh, sweet watermelon strikes a perfect balance with the salty feta. Them when I combined it all with fresh mint, and my AMAZING honey and lime juice dressing, I was in love. My husband and I couldn’t put our forks down! It is so light and refreshing and makes a perfect Weight Watchers Summer Salad Recipe that can be prepared quickly and easily. I have since made this a few more times recently because I simply cannot get enough of it. Each serving is just 2 Points, and it makes an excellent side dish to your favorite main course. I highly recommend giving this one a try ASAP. A refreshing summer salad recipe that conquers that sweet, cold and salty craving in just one bite. This is not only light and delicious, but it’s quick and easy to prepare. It also offers a wonderful flavor combination that is absolutely mouthwatering. Remove rind from watermelon, and the dice into bite sized pieces. Place into large bowl. In a small bowl, combine lime juice, zest, mint, honey and salt. 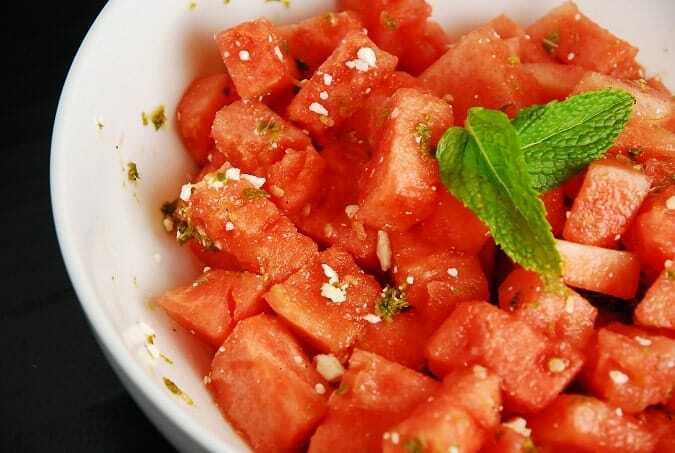 Toss dressing and feta with watermelon. Serve immediately. This salad recipe is best when eaten within an hour of preparing. I made this tonight and it was great!! Thank you very much for sharing!! This looks so yummy! Thanks for sharing I will definitely be trying this!